Photograph: Erin Kuschner Bok choy at Commissary. 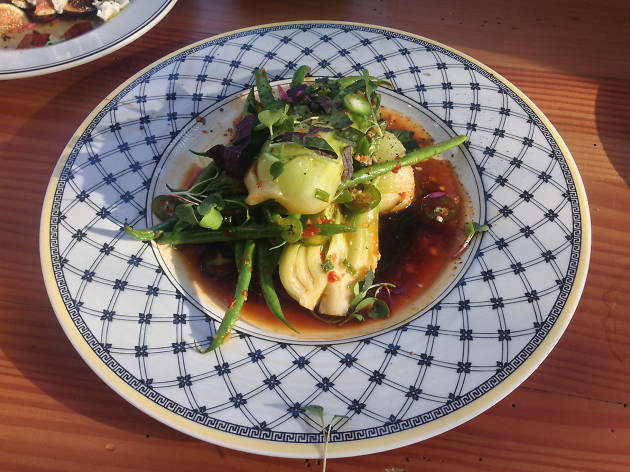 Roy Choi's last installment at the Line Hotel is the vegetable-friendly Commissary, which sits on the rooftop and is housed in a legit greenhouse. Yeah, the requisite chef Choi jokes could be made here (the greenhouse almost demands it), but Commissary is a clean break from Choi's other restaurants, focusing on fruits and vegetables as the centerpiece of each dish. Breakfast, lunch and dinner are available, as are cocktails served in mini plastic buckets. Try the watermelon gin and juice. 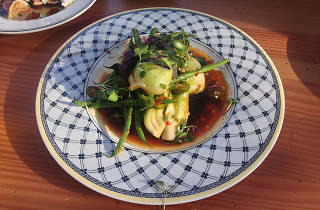 Now not in DTLA... Commissary is one of the trendiest places in the area - Ktown is a cool spot. It's located in the Line Hotel where it has an awesome rooftop vibe and greenhouse restaurant area. It's a very scene-like place as all the DTLA folks flock here when they want to get out. Commissary is a cute spot for a laid-back breakfast or drink. Enclosed in a greenhouse, the room is charming and inviting for guests and situated adjacent to the Line's pool and patio space. Prices are reasonable and the food is delicious.